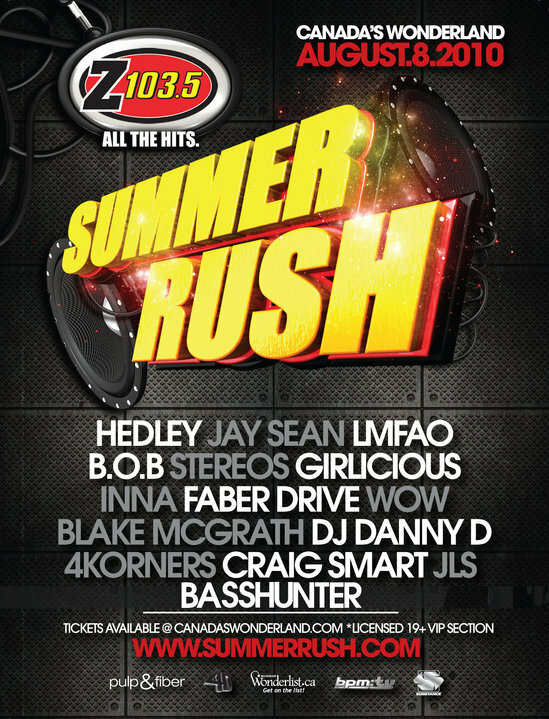 Canada’s Wonderland & Z103.5 present Summer Rush! Performances by Inna, Hedley, Jay Sean, LMFAO, Basshunter,Blake McGrath, Stereo’s, WOW, Girlicious, Faber Drive, Craig Smart, JLS, Dj Danny D, 4 Korners and Dj Mallon! Summer Rush tickets are $49.99 each plus applicable taxes. Summer Rush Season Passholder tickets are $24.99 each plus applicable taxes. To purchase tickets visit Canada’s Wonderland’s page. Doors open at 2:00pm and show starts at 3:00pm. For more on the Z103.5 Summer Rush, including news updates, photos, streaming audio and video, and more please visit Summer Rush Toronto.